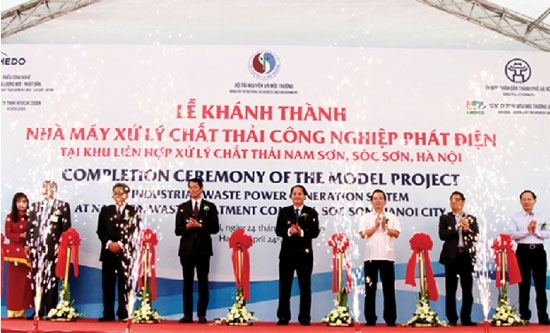 (VEN) - The capital of Hanoi inaugurated Vietnam’s first industrial waste power generation plant at the Nam Son Waste Treatment Complex on April 24, in a bid to protect the environment and recycle waste as a resource for industrial development. The plant, based on Japanese technologies and partial funding, is designed to treat 75 tonnes of waste per day. Part of the power generated is expected to feed into the national grid, and part to serve the operation of the plant itself. The plant covers an area of 16,809sq.m in Soc Son District’s Nam Son Commune with a total investment capital of more than VND645 billion, including VND472 billion from Japan’s New Energy and Industrial Technology Development Organization (NEDO) and about VND173 billion from the local budget. All the equipment and technology were provided by Japan’s Hitachi Zosen Company, while the Hanoi Urban Environment Company built the technical infrastructure. The plant went into trial operation on September 16, 2016. The whole process was implemented under the supervision and evaluation of Japanese experts. The first 1.93MW were produced last March 16, of which 1.2MW for the national power grid and the remaining serving the plant’s own operations. The industrial waste power generation plant harnesses advanced Japanese technologies to tackle industrial waste and create a new energy source in order to reduce pollution and ensure sustainable development, in line with the master plan for solid waste treatment in the capital by 2030, with a vision to 2050. The plant uses a rotary kiln and stoker incinerator with a capacity of 75 tonnes a day that can handle a wide range of waste and limit dioxin output below the designated medical waste restriction. management and operation in October 2017.